October heat is here, and with that, THOSE tips showering on you. 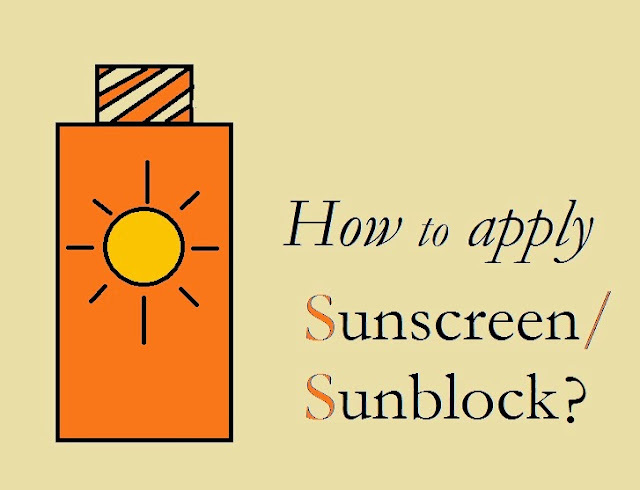 Experts tell you to apply sunscreen, however don't tell you how it is supposed to be applied. I'm not a sunscreen/sunblock applier. I apply it once in two weeks or whenever I remember and have time. I don't really believe that it has any quality in it, to protect us from the harmful sun-rays. But, we need to believe the proven facts. I told her that I just cannot apply sunscreen as it makes my skin more oily. So then she told me how it was supposed to be applied, which would not make my skin oily. Take pea-size amount of suitable sunscreen on your palm. DAB it on your face. You can apply talcum powder/compact powder after applying sunscreen, to give your face a fresh look.